Snowmobiling poses some obvious challenges for people who don’t own them, who have no experience with them, or who don’t have friends or family who are snowmobilers and willing to introduce them to the sport. But that shouldn’t stop you from trying snowmobiling because getting started is easier than you might think. To start, let’s talk about what makes snowmobiling fun. 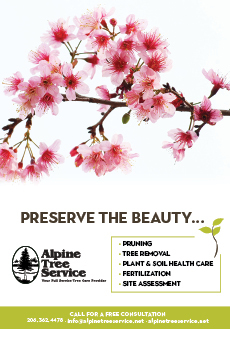 They allow you to access places you couldn’t normally go in winter unless you’re snowshoeing or cross-country skiing. But you can experience more country in a day on a snowmobile than you could all winter if you were on foot. They’re also just plain fun to ride. You can glide effortlessly across a smoothly groomed trail or float across a snowy meadow and carve graceful arcs. Let’s dispel a few preconceptions about snowmobiles that might make you hesitant to try one. First, they’re not difficult to ride. If you’ve ridden an ATV, a jet ski or similar machine, it will be a natural transition. To grossly simplify, you sit, push a button and go. To get started, that’s really all you need to know. Obviously, there’s more to it, but don’t let “I don’t know how to ride one” stop you from getting started. 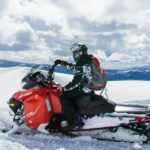 And if you’re still nervous about riding one yourself, you can ride as a passenger because many snowmobiles are designed for two people, so it will still be a safe, comfortable ride if you’re on back. Second, you won’t freeze. Yes, it’s winter, and yes, it’s cold outside, but you will stay plenty warm. 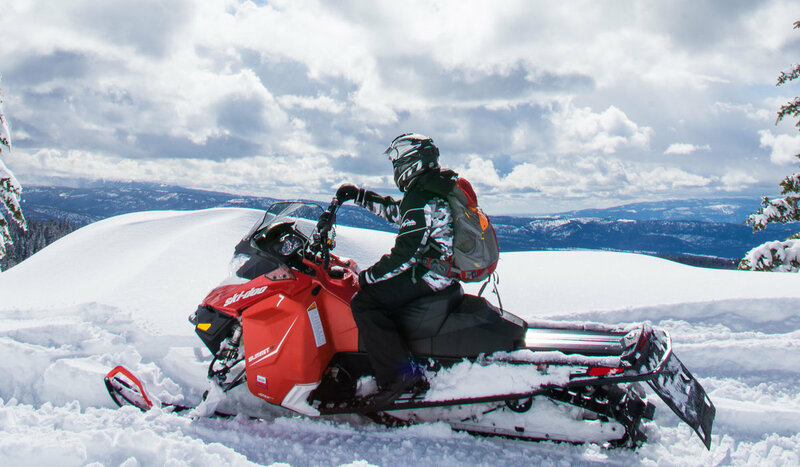 Most modern snowmobiles have grip warmers, some even have heated seats, and they all have windshields and fairings that protect your body from the elements. 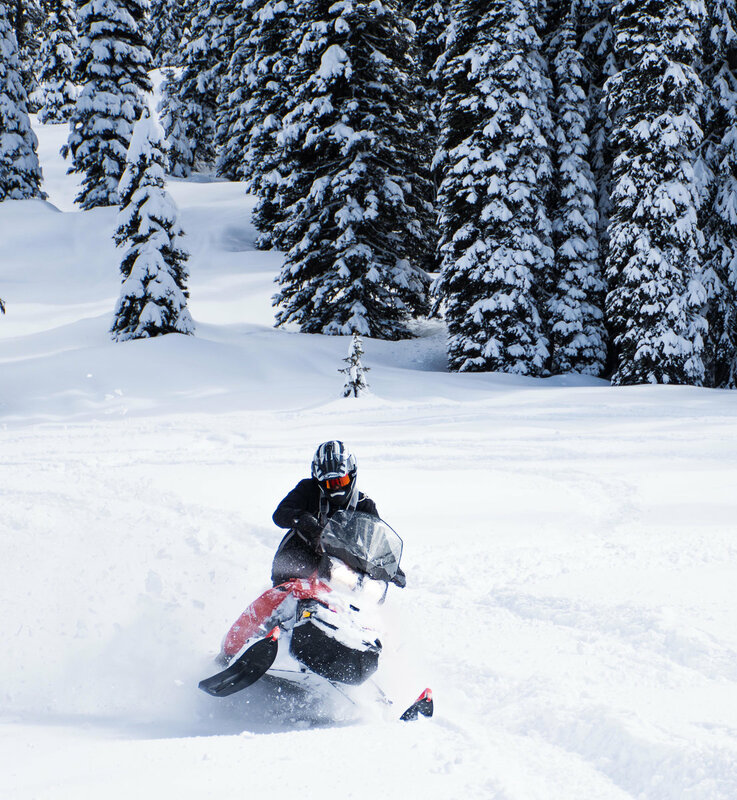 If you’re taking a guided trip or renting a snowmobile, it usually includes a snowmobile suit, helmet, boots, gloves, and other equipment. Third, you can make it as easy, or as challenging as you want. 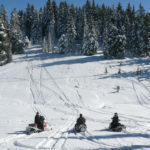 Your trip can range from a casual, fun ride down a groomed trail under the guidance of an expert, or you can take a snowmobile off-trail and play in the meadows and mountains. 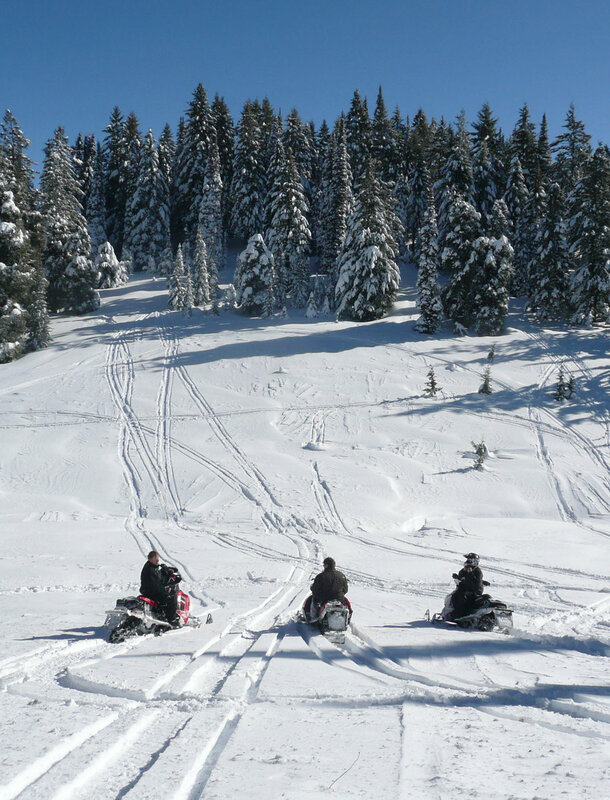 Guided trips are the best way to have a good first experience on a snowmobile. 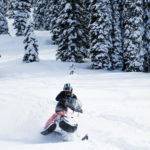 Brundage Mountain Resort is practically synonymous with winter recreation in McCall, and it offers fully guided snowmobile trips out of the resort. Brundage offers half-day and full-day tours starting at $219 to scenic locations near the resort, including trips to Hazard Lake, Upper Payette Lake or Burgdorf Hotsprings for an amazing backcountry experience. If you are comfortable and feel like you could safely go it on your own, Cheap Thrills rentals offers dropoff and pickup service to one of the trailheads around McCall. Rentals include a snowmobile suit, full-face helmet, snowmobile boots and gloves. 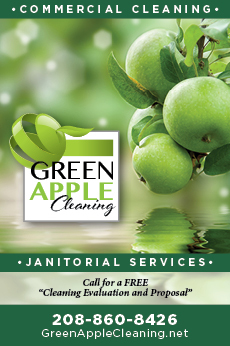 CheapThrillsRentals.com 800.831.1025.